A few months ago, I posted a blog titled, Hygge- Mindfulness Intensified, where I shared a story about the misplacement of my tea kettle and how it led to recognizing memorable moments. Since revealing that blog post, I've had many questions about hygge. Before I begin, what I want people to know is the tea kettle is only a component of my story. The practice of making tea and sipping hot tea is my primary goal...it's actually a part of my familial history. And if you are a regular reader of the Chat Trap Blog or frequent visitor of A Solution B, you may recognize that food as medicine is a part of the discussion in my sessions . Or if you've attended a session in my office, you may be aware that hot tea is offered upon your arrival. Grounding is a technique used to bring a person back to the present moment. This technique is used when a person is anxious or experiencing a flashback as it relates to trauma. In either instance, the person is experiencing fear and feels in danger, despite being in a safe place. Hot tea stimulates four (sight, touch, smell, and sound) of the five senses. The more senses stimulated, while safe, the better. That is why hot tea is an excellent grounding tool. Hygge is an intentional tradition that you create with moments that are special and enjoyable. Hot tea can easily be added to your lifestyle. Simply think of an activity you enjoy and that is pleasurable to you, for instance, morning meditation. 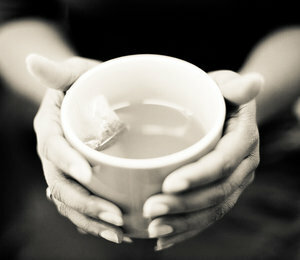 Now, take that same activity and consume hot tea with it... the calming impact is priceless. Recently, I asked my mother why she enjoys hot tea. She shared consuming tea activated comforting childhood memories when her mother would cuddle her up during times of illness. There is nutritional value within tea leaves. For instance, green tea is known to improve an individual's metabolism. In addition, warmer (not necessarily hot) beverages are healthier for the digestive system. There are even suggested studies indicating heart health is impacted by tea. Tea is a diverse beverage. There are numerous flavor combinations and variations of packaging such as tea bags or loose leaf . One can even consume tea with ice, warmed or hot. Alternative uses of tea are homemade hair rinses and paper dye (to give the appearance of aging). Overall, hot tea can assist with maintaining a person’s ability to stay in the present. Alternatively, it may assist in connecting pleasurable and affirming moments, thus resulting in positive memories. Not only are there diverse methods to consume and use tea, but there are many health benefits. So readers…what are you thoughts? Comment below what you would add to this list.